Perfection is a family holiday on the Sunshine Coast. 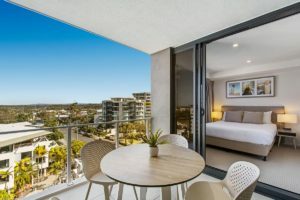 We’ve managed to improve on perfection at these Mooloolaba family resorts. Pack your bags and bring the whole family to The Breeze resort and get ready for an unforgettable and beautiful holiday that you will be talking about for years to come. 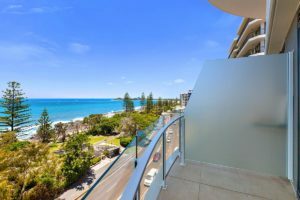 The Breeze has an absolute beachfront location with Mooloolaba Beach and the Mooloolaba Esplanade just down the road. You’ll find the foreshore a delightful place to stroll, with long walks taking you to either the Alexandra Headland or to the Mooloolaba River and Spit area. There’s plenty to take in, either way. Stop and browse the horizon at the HMAS Brisbane Lookoutin Mooloolaba. If you have your PADI license you can hire some gear and explore this man made reef, or if you are keen to take a dive course the Sunreef is a world class (5 star) dive facility in Mooloolaba. Along the Mooloolaba Spit you can enjoy a fun walk with the family. There are plenty of trees lining the pathway, and Underwater World Sea Life is along the way with its exciting collection of live sharks, fish and stingray. Plan a trip for the day and enjoy the shows and live encounters. You can touch the baby stingrays that flap around their miniature reef habitat, get up close and personal with the otters, or catch the seal show — Seals Behaving Badly. 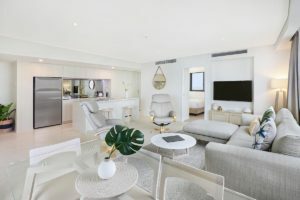 Our delightful fully self contained one, two or three bedroom apartments in this luxury Sunshine Coast accommodation will have you at hello. The apartments are so spacious and comfortable that you may never want to leave. The on site facilities at this resort are superb. The whole family will enjoy the heated swimming pool and the fabulous poolside entertainment area, with the soothing water features and accompanying BBQ and outdoor dining areas, evenings will be complete and you will be replete. We invite you to find out for yourself what perfection can be at these Mooloolaba family resorts. Book now.